"This (the mass slaughter of cats, lies, and a cover-up) will be a model of how to run other projects in the future." It often is said that criminals always return to the scene of their crimes and that certainly was the case on February 15th when the diabolical United States Fish and Wildlife Service (USFWS), the Humane Society of the United States (HSUS), the Institute for Wildlife Studies in Arcata, the United States Navy, and their other unidentified mass murderers gathered to celebrate the successful extirpation of the cats on San Nicolas Island. Presumably, the festive occasion was held on the island itself, located off the coast of Los Angeles, but even that is shrouded in secrecy thanks to the cloak of protection afforded the killers by their collaborateurs within the detestable capitalist media. The sordid details of this exercise in the macabre have not been disclosed but it certainly would not have been anything out of the ordinary if these inveterate cat-haters had toasted themselves with feline blood that they chug-a-lugged from goblets fashioned out of their victims' skulls. 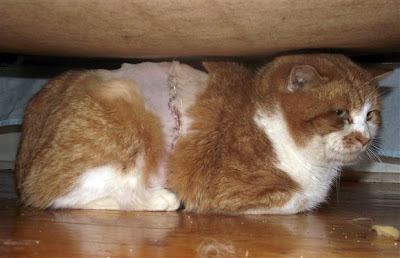 Just as miscreants who abuse cats and homeless men seldom pass up an opportunity to make a record of their crimes so that they can relive their devilry over and over again, the pièce-de-résistance of the gathering likely included graphic videos and photographs of the killers torturing, slaughtering, and dissecting cats. Aristotle once observed that the worst criminals are those who derive infinite pleasure from the despicable crimes that they commit and that description certainly is à propos to all ornithologists and wildlife biologists. No one therefore ever should make the fatal mistake of underestimating these supremely evil monsters because they truly are capable of almost any crime. In fact, the only thing that trumps their lust for feline blood and their overbearing insolence is their outrageous mendacity. When the USFWS and the Navy announced in May of 2008 their plans to exterminate the cats they admitted that there were more than two-hundred of them living on the island. Since the island is closed to the public and all cat advocacy groups were deliberately excluded from both the decision making process and the slaughter, no one outside the circle of killers is able to say with any measure of certainty exactly how many cats were killed. The number very well could have been in the thousands. For whatever it is worth, the HSUS claims to have rescued fifty-two of the cats which it has imprisoned at its Fund for Animals Wildlife Center in Ramona. Supposedly, fifteen of them have been adopted with a dozen more awaiting homes at $75 apiece. In allowing the HSUS to save those cats the USFWS mandated that they had to be imprisoned indoors for the remainder of their lives even though they had been removed from its precious little reincarnation of Doctor Moreau's island. Even those who agree to adopt them must sign a contract agreeing to adhere to the USFWS's diktat. That still leaves at least one-hundred-fifty cats unaccounted for although all of them surely are long dead by this time. According to the USFWS's announced plans, they were to have been either shotgunned to death, killed off by veterinarians, ripped to shreds by dogs brought to the island to hunt them down, or killed in leghold traps. The USFWS claims that it did not use poison but it least considered not only using it but the panleukopenia virus as well. As it might be recalled, between 1945 and 1982 Montrose Chemicals of Torrance dumped tons of DDT and PCBs into the Pacific Ocean which in turn contaminated the entire food chain from microorganisms to fish. Birds and mammals who then ate the fish became contaminated themselves. After sitting on their fat duffs and twiddling their thumbs for decades the United States Government and the State of California belatedly took legal action against Montrose and three smaller concerns and at the end of all the legal wrangling they walked away with a cool $140 million in their bulging coffers. A six-headed beast comprised of the USFWS, the National Park Service, the National Oceanic and Atmospheric Administration, the California Department of Fish and Game, California State Lands Commission, and the California Department of Parks and Recreation then was welded into the MSRP. With all that power and public money at its disposal MSRP began searching around for some animal to sock it to and settled on the cats of San Nicolas. C'est-à-dire, even though Montrose was allowed to destroy the ecosystem with the complicity of the USFWS, the cats of San Nicolas were singled out to pay the ultimate price. The twisted logic and total absence of anything remotely resembling a moral compass that guides the USFWS in its decision making is simply mind-boggling. Quite obviously, it is a rogue and fascist organization that recognizes neither legal nor moral constraints of any sort. Initially, $1,854,100 was allocated for the eradication but recent reports now put the total expenditure at $3 million. Furthermore, the added expense cannot be attributed to the HSUS's efforts to save fifty-two of the cats because, as far as it is known, the USFWS did not give the HSUS so much as a sou. No matter how the situation is analyzed the $3 million price tag is a rather princely sum just to murder one-hundred-fifty cats. That fact alone tends to suggest that the feline death toll on San Nicolas was far greater than the public has been led to believe. Of course, it would not come as any surprise if the USFWS and its accomplices in crime simply stole a lion's share of the money. Either way, there cannot be any denying that slaughtering cats en masse is a highly lucrative profession. Even more outrageously, it was precisely the sailing boys who brought the cats to the island in the first place in order to serve as mousers. They then almost immediately turned around and stopped feeding, watering, sheltering, and medicating them. Instead of instituting a TNR program, they cruelly abandoned them to their own desserts and later starting extirpating them. The Navy's mistreatment of San Nicolas's cats is not the least bit surprising in light of the thousands of illegitimate, half-breed children that the military as a whole cruelly and irresponsibly leaves behind to fend for themselves whenever it embarks upon one of its periodic imperialistic misadventures. That is in addition to all the rapes that its enlisted personnel and officers commit and the sexually transmitted diseases that they so indiscriminately spread. Viewed dispassionately from outside the prism of red, white, and blue patriotism, the military, USFWS, and most federal agencies amount to little more than an amorphous collection of glorified welfare bums, crooks, and murderers who are pursuing agendas that are inimical to the best interests of the animals, Mother Earth, and mankind. Their specialty lies, however, in obliterating anything and anyone that either is no longer of any use to them or poses the slightest threat to their totalitarianism. The only conceivable way of getting to the bottom of what actually happened on San Nicolas would be through the filing of lawsuits under the Freedom of Information Act against both the USFWS and the Navy. It would no doubt take considerable doing but eventually both departments would be compelled by law to disclose how many cats they have murdered, the means used, and the disposition of their corpses. Complicating matters further, such an undertaking would have to be instigated by private individuals because all of the so-called feline advocacy groups are too preoccupied counting their shekels and sucking up to those in authority in order to be troubled. It is axiomatic that since they refused to act in order to save the cats' lives that they could care even less about establishing the truth and holding the killers accountable. Despite the enormous money and power that the feds have seized since 1945 the mass slaughter on San Nicolas would not have been possible without the complicity of the HSUS. "The Humane Society of the United States is the nation's largest animal protection agency and considers the Preferred Alternative of padded leghold traps and shooting cats as inhumane regardless of how this EA (Environmental Assessment) labels and defends this strategy," the organization's Nancy Peterson wrote in a letter to the USFWS on June 17, 2008. (See Re: Comments on the Environmental Assessment for the San Nicolas Island Seabird Restoration Project.") "...In absolutely no case should USFWS shoot cats on San Nicolas Island." Even since that time the HSUS has kept its trap closed tighter than the vault to Fort Knox regarding the hundreds of cats that it delivered on a silver platter to the USFWS's assassins. Instead, it has busied itself staging a series of public relations stunts, such as the ones held in May and August of 2009 and February of this year, where it has congratulated itself for saving a few dozen of them. "This project is a testament to the commitment of multiple agencies to find common ground and develop solutions for feral cats in areas with threatened or endangered species," Peterson's colleague, Betsy McFarland, thundered in a November 3, 2009 press release. 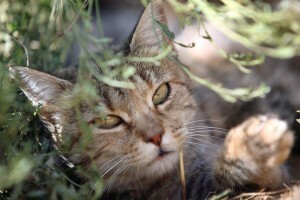 (See "The HSUS and Fund for Animals Dedicate Habitat for San Nicolas Island Cats.") "The cats from San Nicolas Island deserve the opportunity to live a full and happy life, and we're proud to provide that at our sanctuary." If McFarland is truly sincere, the HSUS should amend the motto of its shelter in Ramona from "We speak for those who can't" to "We speak for a minute few of those who can't if and when the money and politics are conducive for us to do so." Actually, the HSUS never has been much of a supporter of cats. In fact, up until as recently as 2006 it referred to TNR as "subsidized abandonment." More recently, it has been conspiring with fraudulent groups, such as Neighborhood Cats in Manhattan, in order to undermine the prerogatives of the volunteers who take care of managed colonies. The USFWS, Navy, and their allies additionally have benefited enormously from the blatant dishonesty of the capitalist media. They all are guilty of covering up and lying about what has occurred on San Nicolas but Barlow of the Ventura County Star is by far the most mendacious of a bad lot. There are many individuals, groups, and institutions that share the blame for the precipitate decline that has occurred in the United States since 1970 but none of them are more deserving of censure than the capitalist media. Anyone who reads English, Deutsche, and French newspapers realizes only too well how poorly Americans are served by their counterparts. The voluminous offerings of Hollywood, radio, television, Madison Avenue, publishing companies, the universities, and professional sports franchises are worth only about one per cent of both the revenue and acclaim that they receive. "The dullest wire services the world has ever seen fill their little monopoly newspapers with self-congratulatory pap. Their radio is unspeakable. Their television is geared to minimal approval of thirty million of them. And anything thirty million people like, aside from their private functions, is bound to be bad," John D. MacDonald opined in his novel, The Quick Red Fox. "Their schools are group-adjustment centers, fashioned to shame the rebellious. Their churches are weekly votes of confidence in God. Their politicians are enormously likable, never saying a cross word. The goods they buy grow increasingly more shoddy each year, though brighter in color. For those who still read, they make do, for the most part, with the portentous gruntings of Uris, Wouk, Rand and others of that same witless ilk. Their magazine fare is fashioned by nervous committees," he continued. "...there is no one left to ask them a single troublesome question. Such as: where have you been and where are you going and is it worth it. They are the undisturbed. The Sleep-Lovers." MacDonald penned that critique way back in 1964 and long before the monopolists seized control over what the masses are allowed to read and hear. Despite the advent of the Internet, deciphering the truth has become even more difficult. For roughly the past one-hundred years or so, wildlife biologists and ornithologists have been using remote islands scattered around the world as the incubators for their feline eradication schemes. 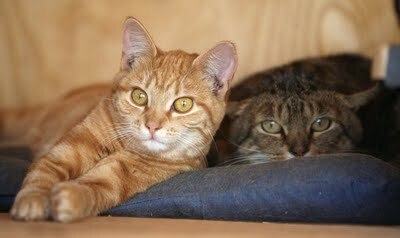 To date, cats have been systematically exterminated on more than one-hundred of them. In the Channel Islands alone, cats have been liquidated on San Miguel, Santa Cruz, Anacapa, and Santa Barbara. Those living on Santa Catalina and San Clemente are destined for a similar fate unless the USFWS is stopped. Most of these eradications have taken place far from the maddening crowd on islands that either are closed to the public or virtually inaccessible because of their remoteness. Consequently, the cat-killers are allowed to commit their dastardly crimes pretty much in secret. Those conditions, coupled with the mendacity of the capitalist media and politicians, also ensures that the big, fat lies uttered by wildlife biologists and ornithologists are accepted not only as gospel but, more importantly, as the first and last word on the subject. The islands' remoteness additionally allows the cat-haters to experiment with various extermination methodologies, whether it be deadly diseases, new poisons, kill traps, or guns, and to thus hone their killing expertise to a fine razor's edge. Having perfected their lies and extermination methodologies, wildlife biologists and ornithologists now are ready to practice their craft on the mainland. The USFWS's stipulation that those few cats saved from San Nicolas be confined indoors until the day that they die is the most poignant example of what it has in store for the species. The scope of the extirpations planned by wildlife biologists and ornithologists is by no means limited to cats. In the Channel Islands, for example, pigs, dogs, and golden eagles also have been eradicated. In that light it is illustrative to point out that the cowardly and mendacious Hutchins is very adept at picking his targets. Although he glories in killing defenseless cats and horses, he never seemingly has a cross word to say about the detrimental impact that cattlemen, sheepherders, developers, oil and natural gas extraction concerns, the military, nuclear power plants, hunters, and polluters have on wildlife and the environment. All of those doomed animals were cruelly uprooted from their homelands and imported by the colonialists in order to assist them in subjugating the Aborigines. They then were abandoned and left to fend for themselves once their cold-blooded exploiters and killers no longer needed them. One way or another, the elites always seem to come out on top. They commit every despicable crime underneath the sun and yet they seldom are held accountable for any of their offenses. Maybe it is passé to any longer care about animals, Mother Earth, humanity, democracy, and even the truth. Nevertheless, all those who have remained silent in the face of the USFWS's diabolical crimes on San Nicolas, the Florida Keys, and elsewhere are destined to rue the day once once a team of its trained assassins comes goose-stepping down Main Street in search of cats to gun down. Even those who do not care about cats have reason for concern in that individuals who would so mistreat animals are highly unlikely to think even twice about doing likewise to people should they ever be presented with the right opportunity. Photos: Hayne Palmour IV of the North County Times (cats), Jason Redmond of the Ventura County Star (Smith), and Institute for Wildlife Studies (Garcelon). "The hawk pounced. 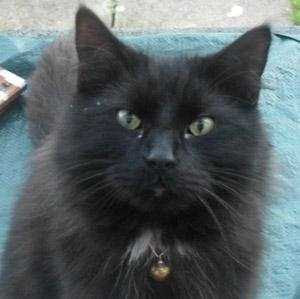 (The kitten) was very fortunate." Not many cats survive being attacked by a redtailed hawk but a tiny black kitten ironically named Hawk is one of a select few who can make that claim. Back on August 8th he was snatched off the ground by one of these voracious predators at a landfill in the town of Cedar on Vancouver Island. For whatever reason, the hawk lost its grip on him and the kitten tumbled back to terra firma. Although he amazingly weathered his descent without any apparent injuries, the hawk's razor-sharp talons pierced holes in both his stomach and one paw. "The hawk pounced," Denise Malsbury of PK Bird Control Services, which uses hawks and falcons to chase away gulls and other so-called pests from the dump, told the Nanaimo Daily News on August 12th. (See "Kitten Was Snatched and Then Dropped in Cedar Landfill by Hawk.") "(The kitten) was very fortunate." Hawk's second stroke of good luck occurred when he was discovered by an unidentified employee of PK who rushed him to Island Veterinary Hospital in Nanaimo, eight kilometers to the north. He underwent successful emergency surgery there and afterwards was transferred to the Nanaimo SPCA in order to begin his recuperation. 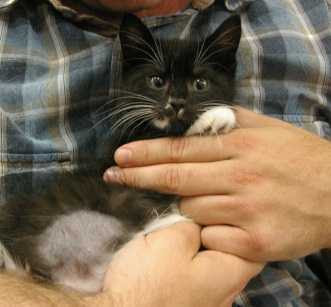 Two other kittens also snatched by hawks at the landfill were not nearly so fortunate. One of them died of a pierced skull while the other one succumbed to a neck injury. The mother cat, who also sustained unspecified injuries, was imprisoned at the city pound and it is not known if she ever made it out alive. Since the landfill routinely is used by irresponsible individuals as a convenient dumping ground for unwanted cats and dogs, it is likely, although by no means certain, that Hawk was a member of that unfortunate family. 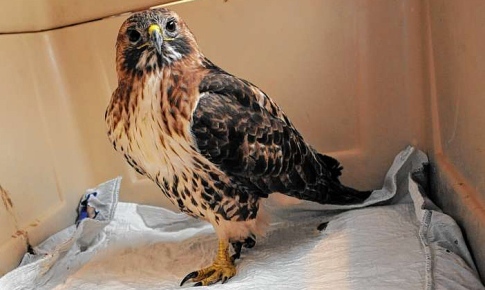 The unprovoked attack upon Hawk was far from being an isolated incident. For example, a poodle named Miracle May was snatched by a bird of prey along British Columbia's nearby Sunshine Coast in May of last year. The dog, which suffered ten deep puncture wounds as well as mangled claws, landed in a kitchen but miraculously survived. Raptors are becoming increasingly popular as a means of controlling certain species that wildlife biologists, capitalists, and governmental officials have come to detest for one reason or another. In addition to gulls, they are being used against such unpopular avian species as crows, pigeons, starlings, ravens, and black birds. They additionally are employed against such perennially maligned mammalian species as rabbits, foxes, Feldmause, and rats. PK Bird, for example, maintains a deadly force of trained Harris Hawks, Saker Falcons, Peregrines, and Nathan Goshawks in addition to redtailed hawks. It is sans doute a hugely lucrative enterprise in that PK Bird's list of potential clients is almost unlimited. For instance, in addition to landfills, its birds are used at saw mills, hospitals, conservation areas, vineyards, shopping centers, and inside municipalities. Although there is not anything posted on its web site to suggest that the company specifically targets cats and dogs, there cannot be any denying that its birds, being indiscriminate predators, are guilty of killing many cats and injuring numerous small dogs. By extension, that makes PK Bird liable in a court of law for their deaths and injuries, whether deliberate or unintentional. JFK instead has turned to the USDA's notorious and secretive band of assassins known as Wildlife Services in order to do its dirty work for it with shotguns. There cannot be any doubt that the agency has the expertise in order to do the job since it has been busy liquidating up to twenty-five-thousand Canada geese at New York-area airports in the wake of Chesley Sullenberger having ditched US Airlines flight 1549 in the Hudson River after he idiotically flew into a flock of them upon takeoff from Laguardia in January of 2009. As far as its treatment of animals are concerned, it would not be incorrect to label the national government as fascist to the core. If he were still alive today Upton Sinclair probably would concur in that he defined fascism as "capitalism plus murder" in his 1944 novel, The Presidential Agent. In addition to hawks, diamondback terrapins often find themselves in harm's way at the airport although so far the facility and airlines that use it have, generally speaking, taken a much more tolerant attitude toward them. That, however, is not out of any genuine respect for either them or their rights. Wildlife Services' killing spree at JFK is especially hypocritical in that it was precisely the feds who approved the building of the airport alongside a wildlife reserve. The birds, ducks, turtles, and other animals of the area were there first and therefore have a legitimate right not only to continue to live there but to occupy the airport as well. If the Port Authority of New York and New Jersey, which operates the facility, cannot find a humane way to live in peace with them the facility should be immediately closed. It is not necessary to sing any sad songs for Kellermann, however, in that his falcons likely will be able to secure gainful employment protecting crops, such as New Jersey's lucrative blueberries, and vineyards. Besides being employed against so-called pest species, wildlife biologists are championing the presence of raptors in urban areas just as they have done so in the past with coyotes, fishers, and other animals that they and others have deliberately driven out of their rural habitats. Municipal officials in cities like New York also have welcomed hawks and other birds of prey regardless of the threat that their presence poses to cats, dogs, humans, and even the birds themselves. For instance, in July of last year a fifteen-pound white cat named Eddie was snatched off the terrace of his fifth floor apartment on Manhattan's West Side by a redtailed hawk. Presumably because of his obesity, the hawk dropped him fifty feet away. As the abduction of Miracle May demonstrated, even small dogs are not exempt from these kinds of attacks. For example, a Chihuahua was attacked by a hawk in Bryant Park, behind the central library, in 2003. When a redtailed hawk suddenly materialized from seemingly out of nowhere and swooped down on him barely missing by inches digging its talons into his mug Moderski's mirth quickly evaporated and he found himself singing an entirely different tune. "I freaked out. Its claws were huge," he added to the Post. "I turned around and ran." The boys from what Frank Sinatra's radio persona Rocky Fortune used to disparagingly refer to as the Irish Clubhouse were called in and they tried unsuccessfully for a half-hour to coax the hawk outside with bread crumbs. They eventually threw in the towel and handed off the ball to their colleagues in the Emergency Service Unit who eventually were able to corral the bird. It then was handed over to the city's notorious killing factory, Animal Care and Control, and that was the last ever heard of it. Hopefully, it later was released back into a safe environment and is still alive. She had injured her leg several months previously but due to opposition from veterinarians, wildlife biologists, and NYU, she callously was allowed to suffer as her condition steadily worsened. Finally, Robert Horvath and his associates at Wildlife in Need of Rescue and Rehabilitation (WINORR) in Massapequa took matters into their own hands by capturing her in Washington Square Park on Christmas Eve. "She came through the surgery well. She woke up and was sitting up fluffing her feathers," Horvath told The New York Times on December 29th. 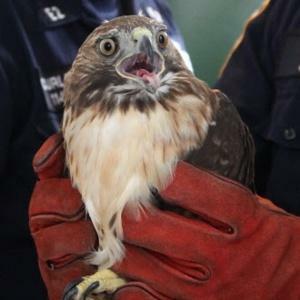 (See "Violet the Redtailed Hawk Is Dead.") "All of a sudden she had a heart attack. The vet did CPR on her for twenty minutes but to no avail." In addition to her useless right foot, the attending veterinarian discovered that her left femur also was broken. A necropsy was ordered but, as far as it could be determined, the results so far have not been made public. It therefore is mere speculation as to what killed her. Normally, surgery of that kind would not be fatal to a healthy hawk but Violet was anything but in the best of health. Specifically, her infected foot easily could have poisoned her system. It additionally is possible that she could have been suffering from some other malady that the attending veterinarian failed to detect beforehand. Veterinary error also is a distinct possibility. Specifically, either the anesthesia or the drugs administered to her could have been too powerful for her weakened heart. It accordingly might have been wiser for the veterinarian to have cleaned and dressed her injuries, performed a series of diagnostic tests in order to have determined her overall health and, if necessary, put her on a rehabilitation regimen prior to operating on her. Furthermore, there cannot be any disputing that Horvath's capture of her caused her tremendous stress and trauma. That is one reason why wild animals never should be either deprived of their freedom or restrained in any manner except in dire emergencies. Above and beyond those considerations, it appears in hindsight that her notoriety likely was the biggest contributor to her untimely demise. For instance, in April of last year The New York Times set up a webcam near her nest that made her famous almost overnight by attracting more than a million viewers. Her presence also proved to be great publicity for NYU and that, at least in part, may have played some role in the school's opposition to providing Violet with the prompt and expert emergency veterinary care that she so desperately needed dating back at least as far as November. 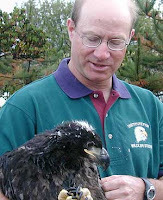 "To be two feet away and look at their talons, and their eyes, and their beaks, and their beautiful feathers, it puts you in touch with the transcendent," NYU President John Sexton, whose office is practically on top of the nest that Violet shared with her mate, Bobby, gushed to The New York Times in the article cited supra. It is just too bad that the interest shown in Violet by Sexton and his fellow eggheads was limited to gawking and counting their shekels. If she had received competent veterinary care in a timely manner she might still be alive today. She also was victimized by wildlife biologists' thoroughly despicable and inhumane insistence upon repeatedly hounding down all animals and fitting them with either tracking devices or electronic surveillance equipment. In Violet's case, the culprit was a metal band placed around her right leg in 2006. Over time the band had become awkwardly wedged on her shin and, according to The Times, appeared to have exacerbated her condition. 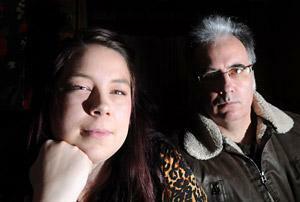 It is highly unlikely that any of those involved ever will come clean but it is conceivable that it was the metal band that, one way or another, ultimately killed her. Just about everyone of them have agendas that are adverse to the needs and desires of animals. This is demonstrated not only by their misplaced priorities but also the meager results that they produce in spite of the large amounts of funding, both public and private, that they annually receive. 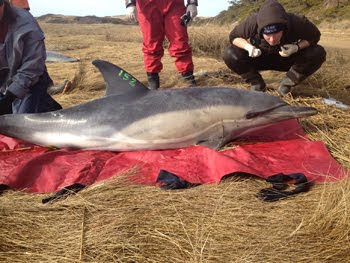 Recently on February 12th, two common dolphins were found dead at separate locations in Cape May County in southern New Jersey. Concerned about the deadly consequences of human intervention, the Marine Mammal Stranding Center in Brigantine often refuses to trap dolphins in nets because the stress brought on by such a procedure sometimes causes the animals to have heart attacks and that no doubt is a valid concern when trapping redtailed hawks and other animals as well. For a vivid account of the horrors and sheer barbarism that electronic snooping entails there is perhaps no better place to look than at the various videos posted online of wildlife biologists and others gunning down wolves from airplanes. The doomed animals bravely attempt to flee but little are they aware that the radio collars fastened around their necks make any escape impossible. To treat animals in such a fashion is nothing short of sickening and revolting at the same time. Always willing to cozy up to those in power, Hollywood did its part by releasing on the very same date the scurrilous, anti-wolf propaganda film, The Grey. Maggie Howell of the Wolf Conservation Center in Westchester County, north of Gotham, tried to set the record straight but she is not any match for the well-heeled liars from Tinseltown. "Wolves don't hunt humans; they actually shy away from them," she told the New York Post on January 24th. (See "Movie's Critics Howling.") "It's not anything new for wolves to be portrayed as the bad guy (sic) in fairy tales, and we don't take it seriously because it's fantasy, but this movie is supposed to be real." It might be recalled that before his death Hal had spent a week undergoing rehabilitation at WINORR before Horvath foolishly handed him over to Putnam and Bogan to be killed. It is conceivable that in both his and Violet's case matters were beyond Horvath's control but it nonetheless does not reflect positively on his efforts that both animals died when they could have been saved. The twin objectives of anyone who seriously cares about animals is to save their lives and to preserve their freedom. Everything else, especially tagging, is a grotesque fraud. Violet was buried in Washington Square Park where she and Bobby used to hunt from the tall trees. Bobby has moved on and now has a new mate. It is unknown what has become of his and Violet's son, Pip. In the end, Sexton and NYU made out all right in that they still have redtailed hawks in residence. Moreover, it is highly unlikely that anyone on campus shed so much as a tear over Violet's passing. Overall, a good case could be made that the use and abuse of raptors, such as redtailed hawks, is neither beneficial for other animals nor the birds themselves. Since all animals have a right to live, wildlife biologists, capitalists, politicians, and others do not have any business designating some of them as pests for the purpose of exterminating them. Left to their own devices, raptors will kill enough of these species; no human intervention is either needed or warranted. There also is something preeminently unsavory about corrupting these birds into doing the dirty work of capitalists and politicians. In doing so, private exterminators have reduced them to the level of the psychopathic mass murderers who comprise the ranks of Wildlife Services and the thoroughly discredited United States Fish and Wildlife Service. Second of all, birds of prey employed by the likes of PK, Kellermann, and others are horribly subjugated and abused themselves. Often bred under abysmal circumstances, they then are confined to their cages from womb to tomb except at such times as when they are dispatched on their killing sprees. They never are granted so much as a moment of genuine freedom and it is highly probable that they are unceremoniously liquidated once they either become injured or too old to hunt. Wildlife biologists, who should be safeguarding them and their habitats, instead are more interested in controlling and snooping on them. Institutions like NYU and The New York Times likewise only champion their cause out of purely selfish motives. Then there is the vitally important question of the suitability of urban environments. For instance, the air, water, and noise pollution in Gotham is nothing short of horrific. Congested skies and streets pose two additional perils for raptors. On top of all of that, sanitary conditions in the city are minimal at best and, as a consequence, disease is rampant. Above all, their addition to urban landscapes has deadly consequences for cats and small dogs. Not only are homeless kittens, such as Hawk, easy targets for them but even domestic cats, such as Eddie, are not even safe at home. Unfortunately, the safety of cats and dogs is not a high priority in New York City or anywhere else for that matter. With individuals it is an entirely different matter and if Moderski had been seriously injured by the hawk that flew at him in his hallway there surely would have been both legal and political repercussions. "It is difficult to get a man to understand something when his job depends on not understanding it." Andrea, the beautiful black and white female who survived being gassed twice at the West Valley City Animal Shelter (WVCAS) in Utah back on October 13th, finally has a permanent home. She was adopted by an unidentified local family on December 11th and joins a household that includes another female and a pair of toms. In addition to having been gassed twice with carbon monoxide, shelter personnel attempted to suffocate her to death in a plastic trash bag as well as to freeze the life out of her by confining her in a refrigerator. The only consideration shown her by shelter employees was that they did not attempt to either wring her neck or to drown her in a bucket of water as some of their colleagues at other institutions have been known to do whenever the deadly gas fails to do the trick. She did not, however, come away completely unscathed. In particular, her life and death ordeal left her with an unsteady gait and she reportedly experienced difficulties using the litter box. Even more disturbing, it initially was feared that she had suffered neurological, liver, and kidney damage. There cannot be any denying that she certainly has been put through a simply horrifying ordeal. Hopefully, CAWS made sure that she received all the proper diagnostic tests but even then it is difficult to predict what maladies she may encounter further down the road and how they may affect her life expectancy. If The Fates remain on her side, she will not encounter any new health problems and therefore will be able to go on to enjoy a long and happy life in her new home. It almost goes without saying that if there ever was a cat who was entitled to her happiness it certainly is Andrea. Just as she lives on, so too does the national debate over the use of gas chambers in order to eradicate companion animals. Unfortunately, the sticks-in-the-mud who run the show in West Valley City so far have proven themselves to be impervious to all morality, intelligence, and honesty. "The issue has been examined closely multiple times since the shelter's construction," Wayne Pyle, city manager of West Valley, told ABC-TV on January 5th. ("Cat Survives Two Rounds in Gas Chamber, But Can't Change City Policy.") "We're comfortable that the policy in place is a good one." In fact, the city, which gasses fifty-one per cent of all animals that it kills, steadfastly maintains that Andrea's survival was a freak occurrence. "We've never had an instance like this since we started using this method so it does work," WVCAS's Aaron Crim told the Daily Mail on October 19th. (See "The Cat That Wouldn't Die.") "It's actually very humane and it's very quick. This is just an anomaly." Documents obtained by Coombs and CAWS under the Government Records Access and Management Act (GRAMA) prove Crim and Pyle to be outrageous liars. Specifically, notes made by shelter employees reveal that gassing failed to kill condemned animals on at least nine occasions between February 2010 and October 2011. It has not been specified what then happened to the animals but presumably they were gassed a second time. If that indeed were the case, it also is likely that some of them survived the second attempt made on their lives only to later die from either suffocation or the cold. Even a cursory recitation of the great suffering that accompanies carbon monoxide poisoning, suffocation, and hypothermia fails to do justice to the myriad of ghastly horrors that take place inside gas chambers. First of all, most gassings are anything but orderly, dignified, and individualized; rather, they are chaotic, undignified, en masse exterminations that sometimes involve up to as many as two dozen animals at a time. Under such abominable conditions, fights and wrestling matches often erupt as the condemned animals jockey for standing room. The blood left on the floor, the scratches on the walls, and the animals' terrified and anguished screams all attest to the utterly diabolical character of gas chambers. Not surprisingly, seizures, convulsions, excessive drooling, prolonged asphyxiation, and considerable banging around are common. Sometimes the suffering and terror drags on for up to a half-hour before the last survivor finally succumbs to the inevitable. In spite of all of that, politicians in West Valley City and nearby Taylorsville, which also uses the shelter to do its dirty work, are not in any hurry to mend their evil ways. For instance, West Valley City Mayor Mike Winder is on record as stating that he wants to witness both gassings and lethal injections before making up his mind on the subject. Taylorsville Mayor Russ Wall has been equally equivocal by calling for an investigation of the shelter. "We're going to make sure the animals are being handled as humanely as possible," he blowed to The Salt Lake Tribune on January 12th. (See "Advocates Pushing to Close West Valley City Animal Gas Chamber.") "Frankly, I don't like either (gas or sodium pentobarbital). It was disturbing to me to watch a euthanasia." West Valley City councilman Corey Rushton is, apparently, the only local politician to be unequivocally opposed to gassing animals. "It's a trend that's on the its way out," he told The Salt Lake Tribune. "The bottom line is the majority of the country is moving away from gas chambers." Since veterinarians always have made good money through the quick and easy administration of lethal doses of sodium pentobarbital to animals that they instead should be treating, it is not surprising that local practitioner Kay Brown is a proponent of that method of killing. "We human beings are responsible for ensuring that an animal's life is taken only with the highest degree of respect and as free as possible from pain and distress," she pontificated to The Salt Lake Tribune in the article cited supra. That is not really saying very much in that all sick animals can be treated to some degree if the money were made available and sanctuaries are the humane option for unadoptable cats that are not returned to managed colonies. Even aggressive dogs can be saved. For instance, although both PETA and the Humane Society of the United States wanted all of Michael Vick's fighting dogs to be killed, humane voices prevailed and just about all of them ultimately were saved. Some of them since have been adopted whereas others are in sanctuaries. With the notable exception of strenuous opposition mounted by cat-hating ornithologists, wildlife biologists, and the United States Government, TNR as practiced by ACA and other groups is gaining a grudging acceptance across the land. The general public's position on the fate of shelter animals is a good deal more problematic. This is due primarily to the fact that it is individual cat and dog owners who abandon their companions at shelters. Beyond that there is the inherent hypocrisy of pet owners who condemn shelters for killing animals but yet think absolutely nothing about having their own cats and dogs killed off by moneygrubbing, unconscionable veterinarians once they become either elderly or sick. In that regard, veterinarians should be compelled by law to disclose, like shelters, the number of defenseless animals that they exterminate each year. Gas chambers are justifiably condemned because of their graphic nature and the horrible suffering that they impose upon cats like Andrea. Nonetheless, they merely are one method of extermination. Even more alarming, their opponents are not the least bit reluctant to sing the praises of lethal injection. In doing so they are advocating that the en masse slaughter of innocent animals is justifiable because these injections supposedly are quicker, more efficient, and inflict less pain. The crime lies in the taking of innocent lives and in that sense the method of execution is irrelevant. All those individuals and groups that so delight in spending their days debating the minutiae of extermination methodology simply are making excuses for the continuation of the status quo. Ten days before Andrea miraculously survived a double gassing by WVCAS, a twenty-pound beagle-mix named Daniel also was gassed by Animal Control in Florence, Alabama. Luckily for him, the staff at the pound gave up on killing him after one attempt and, as far as it is known, he did not suffer any permanent damage. The facility does admit, however, that he was the third animal in a dozen years to have defeated the deadly gas. Thanks to the timely intervention of Eleventh Hour Rescue, Daniel was flown to its shelter in Rockaway, New Jersey, on October 26th by Pilots and Paws. He then was placed in foster care with hairdresser Jill Pavlik. At the Dwyer home he joins Joe's wife, Geralynn, daughter Jenna, and four other dogs. "He's a happy, healthy guy," Jenna exclaimed to The Star Ledger of Newark on November 16th. (See "Having Survived Gas Chamber, 'Miracle Dog' Enjoys Newfound Life with Nutley Family.") "I love him." Not only does Daniel now have a permanent home but Dwyer has a busy future planned for him. Eventually he may be used as a therapy dog but for the time being his talents will be employed in order to help put an end to the gassing of companion animals as well as to promote increased adoptions. For example, on November 13th he appeared at a rally in Malvern in order to lend his support to an eponymous bill that would end the gassing of animals in Pennsylvania. Introduced by State Senator Andy Dinniman, Daniel's Law was unanimously passed by the Agriculture and Rural Affairs Committee on December 14th. "I'm heartened that my fellow committee members unanimously agreed that it's time for Pennsylvania to join the sixteen states that no longer allow euthanasia by gassing," Dinniman stated in a December 16th press release posted on his web site. (See "Senate Committee Approves Dinniman Bill Banning Animal Gassing.") "The method is cruel, unnecessary, and even dangerous to shelter personnel." Like everywhere else except in Washington when it comes to bailing out Wall Street crooks, the legislative wheels grind slowly in Harrisburg thus making it difficult to predict if and when Daniel's Law will become a reality. At last report it had been returned to the Appropriations Committee on January 25th for further consideration. It is just too bad that Dinniman, like politicians in Utah and elsewhere, fails to realize that killing cats and dogs by lethal injection and other methods that do not entail gas chambers also is not only cruel and unnecessary but patently immoral. Moreover, it is nothing short of outrageous that he would cry his eyes out for individuals who have freely chosen to earn their shekels through the liquidation of totally innocent animals. If the truth dare be told, what they deserve is either substantial jail time or, at the very least, a spot in the unemployment line. All of society's sympathies instead should be reserved for their victims. That is not about to change anytime soon because the mistreatment, abuse, and systematic slaughter of companion animals is not only ingrained but a billion dollar racket as well. At the epicenter of this black-hearted scheme are, inter alia, Animal Control officers, shelters, phony-baloney rescue groups, veterinarians, cops, the manufacturers of gas chambers and sodium pentobarbital and, above all, politicians that are too corrupt to fund sterilizations, sanctuaries, veterinary care, and legitimate adoption services. In addition to the money involved, some of these individuals and groups no doubt revel in the commission of their heinous crimes. "It is difficult to get a man to understand something when his job depends on not understanding it," Upton Sinclair wrote in his book, I, Candidate for Governor: And How I Got Licked. Actually, he was being diplomatic because all of those who earn their livelihoods by exploiting animals understand only too well what they are doing; au contraire, they simply think more of money and power than they ever will of the inalienable rights of animals. To top it all off, many of these individuals, groups, and institutions selectively invoke religion as an excuse for not doing more to save cats and dogs. "The Lord works in wonderful ways, because not only was Daniel saved, but he became a symbol and an impetus for us to get this bill going," Dinniman preached to The Star Ledger in the article cited supra. "Dogs are fortunate: they can live in the moment and not resent the past." First of all, any invocation of the supernatural is inherently suspect. Even more so are the pronouncements of adherents who pretend not only to have access to their gods but to know their desires as well. Any religious creed that is satisfied with saving only a handful of innocent animals while simultaneously condemning millions more to be systematically eradicated each year is not one that any genuine animal lover ever would willingly embrace. Such a religion is not only hypocritical but immoral. Nevertheless, at a time when bold and decisive action is urgently needed in order to stop the slaughter of the innocents this society is stuck with the likes of Dinniman and Dwyer and their nickel and dime moralities. Cats, dogs, and other animals are entitled to far better representation than that. Photos: The Mirror (Andrea on blue rug), CAWS (Andrea on yellow and orange rug), and Jennifer Brown of The Star Ledger (Daniel and Dwyer). "Never an injury like that. The cat was almost cut in two." If ever it could be said that a cat had experienced Glück im Unglück, Churchill is the one. The eight- to twelve-month-old homeless kitten's trail of sorrow began during the first week of December when he stumbled into some type of kill trap while searching for food in east Moncton, New Brunswick. Caught right behind his front legs, the deadly snare quickly sliced through the marmalade and white tom's muscle tissue down to his abdominal cavity. From the description of his injuries it would appear that Churchill was victimized by a body-gripper trap although it is remotely possible that a common leghold snare was the villain. His injuries were so severe that he surely would have succumbed to either blood loss, infection, predation, hunger, or the elements if he had not unwittingly stumbled into another trap shortly thereafter. This time around it fortunately turned out to be a live one belonging to the Moncton chapter of Cat Rescue Maritimes (CA-R-MA). "Never an injury like that," CA-R-MA volunteer Madi Legere, who found and rescued Churchill, told the Moncton Times and Transcript on December 14th. 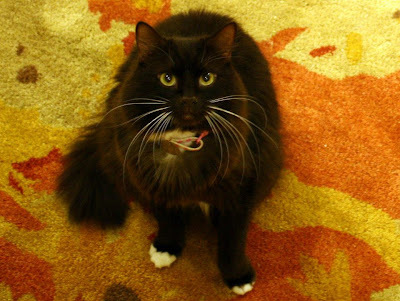 (See "Lucky Cat Escapes Hunter's Snare with Eight Lives Intact.") "The cat was almost cut in two." Churchill also is indebted to the unseasonably warm weather for his narrow escape because CA-R-MA normally does not trap homeless cats during the winter months because it would be irresponsible to release spayed females back into the severe cold. For example, normal nighttime lows in Moncton during December average a bone-chilling 9° Fahrenheit with daytime highs struggling to reach 31° Fahrenheit. "He's just an exceptional fighter," Drmac told the Moncton Times and Transcript. "He's a sweet cat." Nevertheless, it was an awfully close call for him. "It would have been a matter of days (before he died)," Drmac added. "It (the injury) was really bad." As soon as he was well enough to leave the hospital Churchill was transferred to the residence of CA-R-MA's co-director, Marlah Hoganson. "I have to give him antibiotics every two days, and I have managed to do that," she related to the Moncton Times and Transcript in the article cited supra. "He's feral, but he's not aggressive, if that makes any sense." The game plan calls for him to remain with Hoganson until spring. If a good home cannot be secured for him by then, she plans to have him join the fourteen cats who live in her barn. 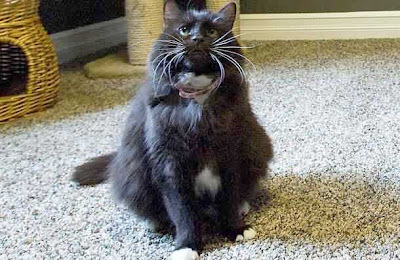 Hopefully that will not be necessary because in addition to being a very courageous and long-suffering cat, Churchill is a handsome fellow who would make a very special addition to most any home. Besides, he is still young enough to adapt to domesticity if an owner can be found who is knowledgeable in the ways of homeless cats and has the prerequisite patience to work with him. Either way, his days of roughing it in the unforgiving Canadian cold and snow are now history. So, too, hopefully are his encounters with kill traps. In an all-too-familiar scenario, Scaum and Horsewood took Marmite to a local veterinarian and had him killed. This is in spite of the fact that injured paws can be surgically repaired and broken legs can be set and put in casts in order to protect them from further damage while they heal. Even in severe cases, cats can get by just fine with severed appendages. Three-legged cats are common and in Monmouth, Illinois, one named Trace only has two. It thus would appear from the available information that Marmite's life could have been spared if Scaum and Horsewood had been either willing or able to provide him with proper, expert veterinary care. The veterinarian who so callously snuffed out his life in return for a hefty fee is likewise not only a disgrace to the practice of veterinary medicine but a sorry, miserable excuse for a human being as well. Churchill, whose injuries appear to have been far worse than those sustained by Marmite, is alive today thanks to the compassion, generosity, and genuine respect for feline life shown to him by Legere and CA-R-MA. Marmite, on the other hand, received none of that from either his owners or the attending veterinarian and as a consequence is prematurely dead. Even in death there has not been any peace for him because instead of receiving a dignified funeral and a proper burial, his mangled corpse has been placed in cold storage so that the do-nothing rotters at the RSPCA can have a gape at it, strut around, and utter meaningless platitudes. Not only is it highly unlikely that it will lift so much as a finger in order to bring Marmite's killer to justice, but it previously has demonstrated a total unwillingness to press the authorities for an across the board ban on kill traps. "The RSPCA has said it would like to see snares banned, but it doesn't look like this is going to happen in the near future," a mouthpiece for the organization admitted to The Press in the article cited supra. That is in spite of an increase in these types of incidents all across England. "Unfortunately, there are far more incidents of animals getting caught in traps, like snares, than there should be and RSPCA inspectors often have to deal with incidents in which snares have inflicted injury and extreme suffering to animals," the spokeswoman continued. "Snares are usually set to catch foxes or rabbits for the purpose of pest control but their victims can often be badgers, cats, or dogs. Snares don't discriminate between species and anything that moves through the snare's noose is a potential victim." In 2007, emergency personnel in Decatur, Alabama, were forced to use water hoses in order to flush a terrified black male out of a sewer after he had taken refuge there in the aftermath of getting tangled up in a leghold trap. Even though the rescue was a success, it was feared that he might lose a paw. It thus seems clear that kill traps are incompatible with any halfway humane animal rights agenda. Moreover, those groups and individuals, such as evangelical theologian Vantassel, who persist in deploying them in order to maim and kill defenseless animals are guilty of acts of gross animal cruelty and should be punished accordingly. Until the day dawns when these heinous killing devices are outlawed once and for all time something desperately needs to be done in order to ensure that when cats like Marmite are injured by them that they receive the emergency veterinary treatment that they so richly deserve. Getting caught in a kill trap and being severely injured was bad enough in its own right but he certainly did not deserve the expedient of having his precious, young life extinguished. English society failed him through its steadfast refusal to ban these deadly devices, his owners betrayed his love and trust by refusing to pay for his treatment, and the attending veterinarian completed the trifecta of criminal immorality by ending his life. Three strikes was all it took in order to put Marmite out of the great game of life but if there were any justice in this world the fortunes of all those involved would have been reversed and Marmite would still be alive. Photos: CA-R-MA (Churchill) and The Press (Marmite, Horsewood and Scaum).